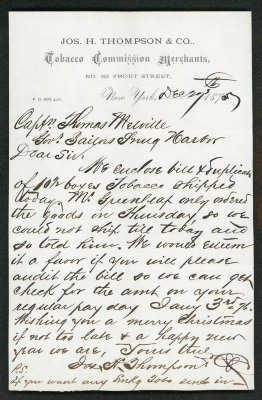 This letter to Governor Thomas Melville from Joseph H. Thompson accompanied a bill for boxes of tobacco shipped to the Sailors' Snug Harbor, along with wishes for a merry Christmas and happy New Year. Institutional Affiliation: Jos. H. Thompson & Co. The Sailors' Snug Harbor records are the Property of the Trustees of the Sailors’ Snug Harbor. The collection is on permanent loan at the Stephen B. Luce Library of SUNY Maritime College.